Here, we present sailing tables for the voyages of steamships that carried mail between Canada and the Orient and Canada and Australasia. The tables on these pages extend only to 1914. Longer tables will be in the book Canada's Pacific Maritime Mails, to be published by the PHSC. From 1887 to 1941, the Canadian Pacific Railway (CPR) provided steamship service between Vancouver and Victoria, British Columbia, Canada and Hong Kong with calls at Japan and China, and later at Manila, Philippine Islands and Honolulu, Hawaii. For the first few years, chartered steamships were used. In 1891, the route was taken over by three specially designed Empress liners. At this time, a contract between the CPR and the British government took effect, subsidizing mail service between Britain and Hong Kong via Canada. These three CPR Empresses and their subsequent offspring carried mail, passengers, and freight speedily across the Pacific for over half a century. 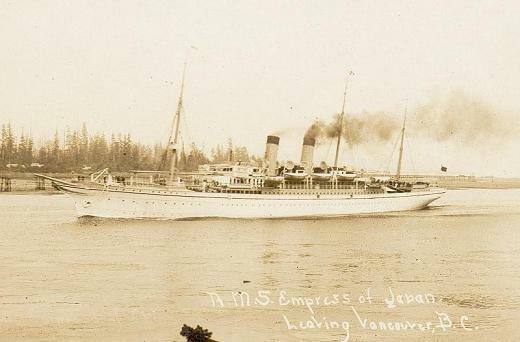 The CPR liner Empress of Japan (I) departing from Vancouver Harbour. Cover carried from Vancouver to Japan in the CPR Empress of India, departing from Vancouver on August 2, 1897. 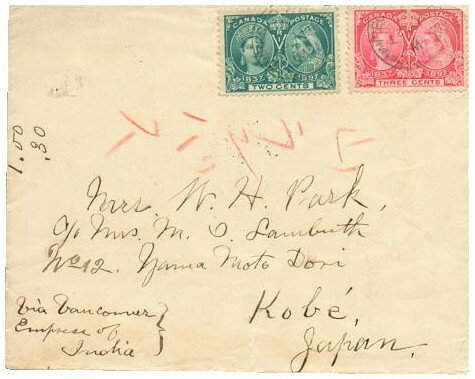 The cover bears a Yokohama backstamp dated August 16, 1897, the date that the Empress arrived there. The cover was mailed on the C. R. Ry. Port Arthur & Winnipeg Mail Car on July 23 and is franked with a 2¢ and a 3¢ 1897 Jubilee commemorative stamp. The Canadian-Australian Steamship Company (the C-A Line, later called the Canadian Australasian Line Limited) operated between Sydney, Australia and the two British Columbia ports from 1893 to 1953. The CPR was affiliated with this company, and from 1931 was half owner of it. In the first 18 years of service, the route changed a few times. Finally, in the summer of 1911, Auckland, New Zealand was added as a permanent port of call. The route established then remained the same until service ceased in 1953, serving six ports: Sydney, Australia; Auckland, New Zealand; Suva, Fiji; Honolulu, Hawaii; and Victoria and Vancouver, British Columbia. The C-A Line Aorangi (I) entering Vancouver harbour. 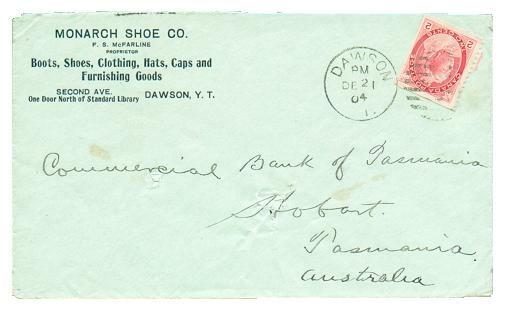 Cover mailed to Tasmania at Dawson, Yukon Territory on December 21, 1904. 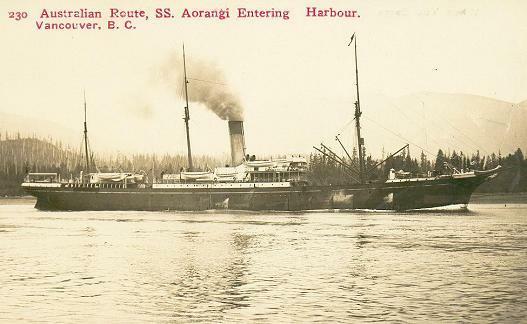 It was received in Vancouver on January 5, 1905 and departed the next day in the C-A Line steamship Aorangi (I). The 2¢ Empire rate was paid with a Numeral booklet-pane stamp; these booklets were commonly used in the Yukon. Departure and arrival dates for the CPR and the C-A Line have been obtained from contemporary newspapers of Vancouver and Victoria, the Fiji Times, the Melbourne Age, and the London Times and other sources. We are anxious to obtain any missing dates; please send them with their source to the author, Gray Scrimgeour. Here is a list of the CPR and C-A Line steamships. The ships are listed in the order of their entry into service with each company. The Years of Service column lists the dates when these ships operated across the Pacific from ports in the Pacific Northwest. Halliburton, W.H., Roger, C., and Spaulding, R.M. Jr. Pacific Crossings from Japan. 1858-79. Silver Spring, Md., International Society for Japanese Philately, Inc., 1969. Frajola, R.C., Perlman, M.O., and Scamp, L.C. The United States Post Offices in China and Japan 1867 to 1874. New York, The Collectors Club, 2006. Complete dates between San Francisco and the Orient from 1867 to 1875. Proud, E.B. British Post Offices in the Far East. Heathfield, East Sussex, Proud-Bailey Co. Ltd., 1991. 19th century dates between Hong Kong and both Vancouver and San Francisco. Whiteley, D.H. Steam on the North Pacific: British Columbia to the Orient. 1887-1941. Winnipeg, DHW Publications, 1999. Many dates between the Orient and Vancouver to 1921. White, J.S., editor. The Postal History of New South Wales: 1788-1901. Philatelic Society of New South Wales, 1988. McNaught, K.J. The Complete List of Sailings of Trans-Pacific Contract Mail Steamers Carrying N.Z. Marine Post Offices Between 1923 and 1938, manuscript, 1964; reprinted, Postal History Society of New Zealand Inc., 2000. Hubbard, W. and Winter, R.F. North Atlantic Mail Sailings 1840-75, US Philatelic Classics Society. Complete list of sailings between North America and Europe from 1840 to 1875. Arnell, J.C. Atlantic Mails. A History of the Mail Service between Great Britain and Canada to 1889, The National Postal Museum, Ottawa, 1980. Sailings from 1795 to 1890. Duckworth, H.E. and Duckworth, H.W. The Large Queen Stamps of Canada and Their Use: 1868-1872. Toronto, Vincent G. Greene Philatelic Research Foundation, 1986. Sailings from 1868 to 1872. Kirk, R. British Maritime Postal History, Volume 1, The P&O Bombay & Australian Lines - 1852-1914. Proud-Bailey Company and Studioprint, Dereham, Norfolk, undated. Kirk, R. (a) British Maritime Postal History, Volume 2, The P&O Lines to the Far East. Heathfield, East Sussex , Proud-Bailey Company, Limited, undated. Cockrill, P. Listing of Mail Carrying Steamship Lines 1899. Hampstead Norreys, Newbury, Cockrill Press, Booklet No. 59. Official listing by the Imperial German P.O. of shipping companies, 1899. Copyright © Gray Scrimgeour 2006. All rights reserved.